Welcome Box Valued at $63 – FREE to New Maven Subscribers! Treat Yourself to a Gorgeous 4-Piece Welcome Box Valued at $63 – FREE to New Maven Subscribers! Treat yourself to the freshest nail colors and beauty products each month with a Julep Maven Beauty Box subscription. Julep’s products have been featured in Oprah, Real Simple and even Vogue! Join Julep Maven now to get three bright & beautiful summer shades (Sam, Polly and Denise), two buffer blocks and a Bonding Base Coat that will double the life of your manicure! You’ll get this limited-time Treat Me Welcome Box valued at $50+ (just pay $2.99 shipping) when you sign up for a Julep subscription. As a Julep Maven you’ll receive a box of brand-new, full sized nail color and beauty products each month – and you deserve it! •Julep Maven is affordable. Every month you get more than $40 of full-size products for just $24.99 per month (tip – prepay for three months at a time and save $15). •Julep Maven is the only customizable box of full-size, limited-run nail colors and beauty innovations. That means no surprises, no dupes or colors you don’t like. You can see what is in your box each month and have the option of swapping out colors/products you already have or don’t want. Get started now! Join Maven and get the Treat Me Welcome Box FREE ($50+ value) – just pay $2.99 shipping using the code TREATME. Want an even better deal? Pre-pay for your first three months of Maven and get the Welcome Box and shipping FREE. Either way, you are going to LOVE being a Maven. Previous A TRIP DOWN MEMORY LANE W/ THIS G & R CLASSIC! 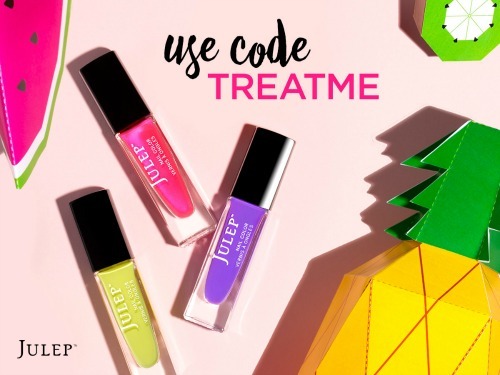 Next 20% off at Julep.com!